Electro-oxidation, also called electrochemical advanced oxidation, uses electricity to generate hydroxyl radicals to perform oxidation in wastewater treatment. A new commercially available electro-oxidation process—Zimpro® Electro-oxidation (ZEO)—is especially effective for treating the highly problematic spent caustic streams produced by sweetening operations in petroleum refineries and ethylene plants, particularly at volumes below the economically feasible threshold for existing established treatment technologies. The new electro-oxidation process overcomes the practical limitations of earlier technology by employing a robust, freestanding, substrate-less, electrically conductive electrode fabricated from synthetic diamonds. This allows the electrodes to handle high current densities while providing a long life in this difficult waste stream. It also allows for on-site treatment while avoiding the potential liability of handling hazardous spent caustic material and shipping it off-site. In addition to providing background on the technology, its applications and its predecessors, this paper presents data from a treatability study using the new Zimpro® electrooxidation technology on a variety of refinery spent caustic streams. 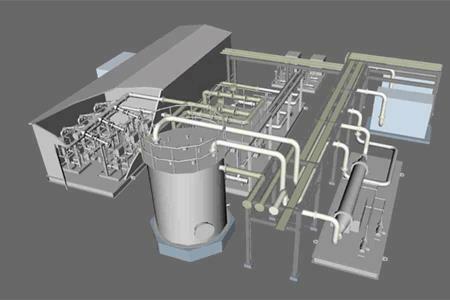 The spent caustic waste streams studied contained a mixture of organic and reduced-sulfur compounds. Following treatment, the odorous sulfides and mercaptans were consistently eliminated and the majority of the COD was removed, producing an effluent that allows final polishing in a biological wastewater treatment facility.